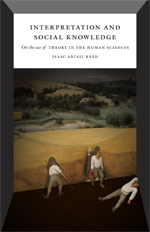 A lot of people have bugged me about Isaac Reed‘s book, Interpretation and Social Knowledge: On the use of theory in the human sciences. It’s a book that offers an explanation (sorry!) of the different ways that social researchers construct explanations. I think this a wonderful and engaging book, but it has some major points that I disagree with. Let’s just say that, me and this book are frenemies. This book argues that there are three types of explanations to be found in the social sciences. There is “naturalism” or “positivism,” where explanations are tied to a social reality that is “out there.” There are normative explanations, which focus on social processes because of what they say about some ideal state derived from ethical theory (e.g., Habermas’ public sphere account vs. the theory communicative action). The third style of explanation situates human action within worlds of meaning, which Reed calls interpretive sociology. I level a few criticisms at this book. One is purely stylistic. The book is filled with loving references to the likes of Roy Bhaskar and post-modernism. I don’t think their work adds much to Reed’s main point. I can easily that some sociologists would just stop reading. Why would a demographer or labor market researcher bother with such a book? There’s a lot of preaching to the choir. Second, there’s a big argument that interpretive sociology is inherently different than the naturalist or positivist sociology that takes it cues from the physical sciences. My view is different. Ideas about falsification, inference, data collection, hypothesis testing, and so forth can be applied to systems of symbols and meaning. In linguistics, for example, there are successful research programs that focus on how systems of language evolve and are put together. No reason that can’t be applied to the historical study of colonialism, Christianity, or whatever. In fact, there is something called schema theory in psychological anthropology, which takes Reed’s idea of “cultural landscapes” and converts it into a positivist research agenda. The separation of interpretation from naturalism is even more implausible once we consider how the same argument would play out in the natural sciences. Let’s take biology. It’s fairly clear that you can’t understand animal behavior without thinking about the organism’s history and ecosystem. So what should a biologist do? Option A: Develop a general principle that will help us explain variation in ecosystems, organisms, and evolution. Option B: Ditch the ideas of normal science and do ad hoc interpetations of different animals and their ecosystems. I hope that the reader thinks, along with Darwin, that option A is very desirable. Those that separate qualitative and interpretive research from positivist modes of social science are missing something important. Meaning systems, or cultural landscapes, are complicated systems built up from simpler structures that are embedded in larger systems. “American culture” is emergent from American words, emotions, norms, social practices, and so forth. If you buy that argument, then the link between interpretive work and naturalist social science is obvious. You need a positivist explanation of how these complex systems are born, evolve, and operate. It’s not an easy problem by any means, but it’s one that easily fits within the ideas that we associate with natural science. Reed does make some points in this direction. For example, in chapter four, he says that interpretations should be “locally consistent.” But he needs to go farther. Interpretation needs to always have an eye on general principles. Interpretations of different groups and historical eras need to be consistent with each in ways that provide guidance for future research. Without such an imperative, interpretive sociology threatens to devolve into the solipsism of historical specificity. Haven’t read the book yet–it’s on my list, but how is this possible: “The book is filled with loving references to the likes of Roy Bhaskar and post-modernism”? Bhaskar and critical realism are, well, realists; whatever post-modernism is, it is almost always taken to be anti-realist. Indeed, even contemporary critical realist works (say, like Margaret Archer) still go out of their way to ritually denounce whatever they think post-modernism is as an intellectual scourge. Your subsequent criticism makes it sound like social theorists aren’t sociologists but aliens. Very odd. What a co-incidence! I am currently reading the book. I am on the second chapter now. An interesting read for an Early Career Researcher like me; some of the stuff is beyond me though but again I am new to this! Reed gives illuminating examples of what he calls ‘maximal interpretations’. Those examples highlight exemplars of qualitative research writing for me because I like qualitative narrative research. I am a bit unsure about his claim that only interpretive research can give us maximal interpretations. Fabio’s points above make me think harder! But his point regarding the greater ability of interpretive research to handle ‘meanings’ in social interactions is worth noting. I am still on chapter 2 so I would like to share more of my impressions with my more learned colleagues here on orgtheory.com who are well-versed in sociology. One thing Reed has done to me: I am now extremely interested in reading the original foundational work on sociology (Weber et al), as opposed to other recent work which draws on the founders. Thanks. Amer Khan, lecturer, School of Business and Design, Swinburne University of Technology, Kuching, Malaysia. Thanks for the review, Fabio — I’ve been working through some of Prof. Reed’s (2008, 2010) articles in Sociological Theory and greatly appreciate your perspective on the book. Fabio: Certainly ideas about falsification etc. can be applied to systems of meaning, beliefs, etc. – Reed’s point is not that this is an impossible task but that it is a non-interpretive task. In other words: the epistemological claims of interpretive and positivist sociology are distinct, and furthermore, that the nature of culture as an ontological object makes positivist approaches to the study of culturally-bound worlds suspect. I don’t necessarily agree, but it’s important to note that the claim isn’t about the possibility of applying positivist methods to culture but rather the wisdom and entailed assumptions of doing so. FWIW: I’ve written about Reed’s book here. Craig McFarlane: the only thing Bhaskar and Postmodernism actually have in common is that Fabio finds them distasteful, or complicated, or something like that.